The controller hardware is suited in cases where different drives and motion sequences need to be precisely coordinated within a system. It relieves the central programmable logic controller (PLC) and reduces response times. As an operator of complex systems, you need to ensure that different motion sequences, multiple axes, and various drives are precisely coordinated with one another The efficiency of your production depends on this. In order to ensure this required intelligent coordination, you also need both intelligent and reliable control technology. The control cards from our controller hardware portfolio have been precisely tailored to meet this requirement. Control cabinet installation units are used wherever users are required to implement centrally processed applications. Thanks to their simple operation and multitude of ready-to-use function modules, they ensure the efficient implementation of motion functions. Their real potential comes to the fore when movements are permitted across multiple axes and need to be coordinated precisely. If the different motion axes within a system are connected via a rapid, synchronous system bus, our recommendation would be to control all motion control tasks via a single controller. Our control technology is ideally equipped for this too. Depending on the performance class, our controllers can handle up to 64 axes using an SBus or SBUSPLUS (system bus with onboard EtherCAT interface). The integrated system bus also allows connection to any of the inverter types in our portfolio. You can also benefit from the outstanding performance features of our control technology and implement functional and cost-efficient automation for your systems and machines. DHx21B standard performance class for use as a module controller with motion control functions such as positioning, average response times, and a maximum of 16 axes. DHx41B advanced performance class for use as a module controller with high-end, motion-control functions such as electronic gear units, electronic cams and robotics, short response times, and a maximum of 16 axes. 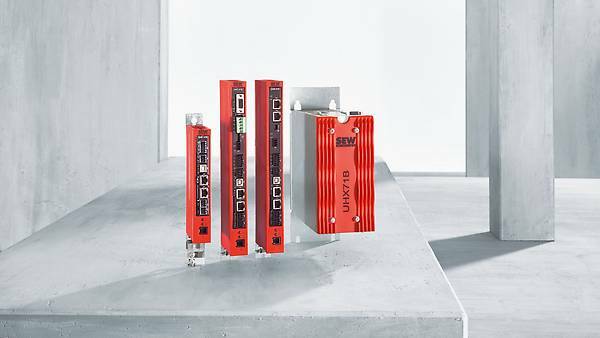 UHX71B power performance class for use as a module controller or controller for complete automation for demanding motion-control and automation tasks, response times in the 1-millisecond range, and a maximum of 64 axes. The controller can be extended by a second Windows 7 Embedded operating system. Our experts understand your industry and requirements. The performance class MOVI-PLC® power is available in unit versions T0 to T25. MOVI-PLC® power is an industrial PC with its own slimline, upright housing. The power performance class provides the ideal solution for centrally processed high-end, motion-control applications with a high number of axes and response times in the 1-millisecond range. The UHX71B compact controller is available as MOVI-PLC® power motion and logic controller and can be freely configured in accordance with IEC-61131-3.